Overlapping of full-flood protection. This provides protection across the length of the hood, regardless of equipment type with a few exceptions. Planning is important when selecting a fire system for restaurant kitchens to mitigate the risk of fire and prevent loss of life and property, says US-based Greenheck, a leader in air movement, conditioning and control equipment. 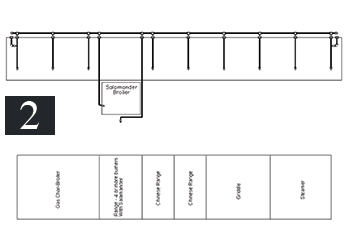 Kitchen hoods often are thought of at the end of the restaurant planning process. Typically, hoods are nothing other than small outlines on plans, and in some cases, it could be debated, they are afterthoughts. Naturally then, restaurant fire suppression systems are also late to the table. Any kitchen hood that is servicing grease-producing equipment is required to have a restaurant fire suppression system installed. Heat, flame, grease and oils are recipes for fire in a building – and part of the cooking operation in kitchens. With the risk of fire, a great deal of concern and planning should be put into ensuring that proper fire protection is implemented to protect the investment, not only in terms of material property but the human life within. Understanding the appliances that will be required for a cooking operation is important in selecting the proper fire system. Thinking ahead of time also mitigates the risk of back charges. When working with a manufacturer or representative to get a fire system design, it is important to provide the size of the hazard area on the appliance versus only the appliance dimension. The hazard area is typically the part of the appliance that actually produces heat such as the burners, the griddle top, the fry oil vat, etc. This will allow for the most efficient and cost-effective design. Particular attention should be given to local codes. Some jurisdictions require full dump tests to ensure proper system operation, which come at an additional expense. Some only require puff tests where air is pushed through the system. In addition, local codes may limit the distance from the hood or define the location for a remote pull station. Knowing about these regulations in advance will help in better allocating financial resources and time management on the project. Restaurant fire suppression systems use a wet chemical for suppressing fires. These chemicals vary by manufacturer but are typically a potassium-based chemical that essentially forms a foam blanket over the appliances. This blanket traps flammable vapours and prevents oxygen from fuelling the fire. Another system on the market uses a wet chemical and then dispenses water which keeps rebuilding the foam blanket and cools the appliances faster, mitigating the risk of re-flash. Regardless, all approved restaurant fire suppression systems are tested and listed to UL 300 to ensure that they are an efficient means of suppressing a fire. The salamander has appliance-specific protection but overlapping protection continues before and after it, enabling rearrangement in other areas. • Likewise, the clientele consumes more of a certain product, and to maintain service, one piece of equipment is changed with a duplicate of another. The alternative is to use what is commonly referred to as overlapping or full-flood protection. 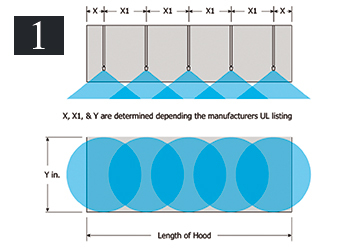 Overlapping protection provides protection across the entire length of the hood regardless of equipment type (Figure 1) with a few exceptions identified below. Two very reliable manufacturers of these systems are Amerex and Ansul. Exceptions to this protection are upright broilers/salamanders, cheese melters, and wide shelves. However, this protection can still be utilised. Appliance-specific protection (Figure 2) occurs at the salamander but overlapping protection continues before and after it so that the appliances can be rearranged or changed out in the other areas of the hood. This solution saves the time and expense of coordinating changes and modifying the system. When planning a project it is important to think about how to get ahead of the game both in terms of the appliance line-up and understanding local regulations. Getting caught with insufficient protection or planning for testing can be a costly endeavour, especially if it delays the opening of a facility, when it can be prevented with a little forethought.